The collector's edition of Splinter Cell: Blacklist isn't cheap, but it's the only one I've ever seen that actually flies. First things first: The Splinter Cell: Blacklist Collectors Edition will cost you 170 bucks. Wow! Why so much, you wonder? Because it includes an actual airplane: a radio-controlled, twin-engine model of the Paladin aircraft that Sam Fisher and the Fourth Echelon team use for their globe-hopping shenanigans. Lest there be any confusion, let me be perfectly clear: it flies! 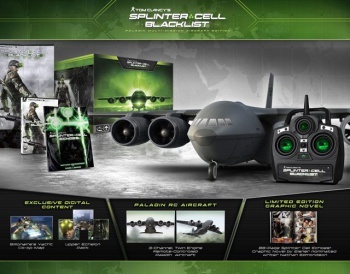 Other stuff in what is officially known as the Splinter Cell: Blacklist Paladin Multi-Mission Aircraft Edition includes the 88-page Splinter Cell Echoes graphic novel, a poster, the "Billionaire's Yacht" co-op multiplayer map and the Upper Echelon Pack containing the "Dead Coast" co-op map and the Gold Sonar Goggles and Upper Echelon Suit in-game items. It's pretty cool, although I don't know if it justifies a $110 jump over the price of the regular edition; battery-powered RC planes aren't that expensive, after all. Then again, this isn't just any plane: This is the plane that carries the man who will put you in a graveyard full of guys just like you if you don't give him something useful. That probably counts for something. Alas, this swanky CE will apparently only be available for the Xbox 360 and PlayStation 3; PC gamers will have to stick with the standard release. Splinter Cell: Blacklist comes out on August 20.